Current and past Tempe City Councils think they should turn Tempe into Copenhagen. It is too late. But that doesn’t matter, there is federal money dangling like a carrot and Tempe is bound to get its hands on it and make fundamental changes to our comfortable, established neighborhoods. Country Club Way is a quiet street in the middle of neighborhood after neighborhood, located between McClintock and the 101 in the east end of Tempe. McClintock Drive already had bike lanes forced upon it, and they are rarely used. The Country Club Way project is literally a 1/2 mile east of McClintock’s bike lanes and the changes to the neighborhoods will be expensive and unnecessary. The cost is estimated to be……well, we don’t know. Of course, word coming from Tempe’s officials is unclear and misleading. Here is a screenshot from Tempe’s website. A few comments: Maricopa Association of Governments has a lot of power and answers to themselves. 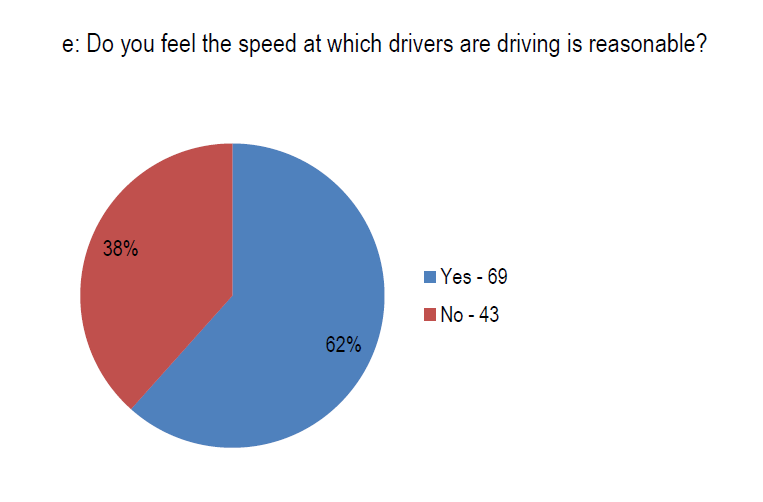 As much as we complain about Tempe and its bike lanes, MAG bears some responsibility for coordinating many expensive changes to the Phoenix area. The various municipalities do need a master plan to move traffic especially due to the growing population, but MAG should have nothing to do with bike lanes in Tempe neighborhoods. $83,000 just for a design? 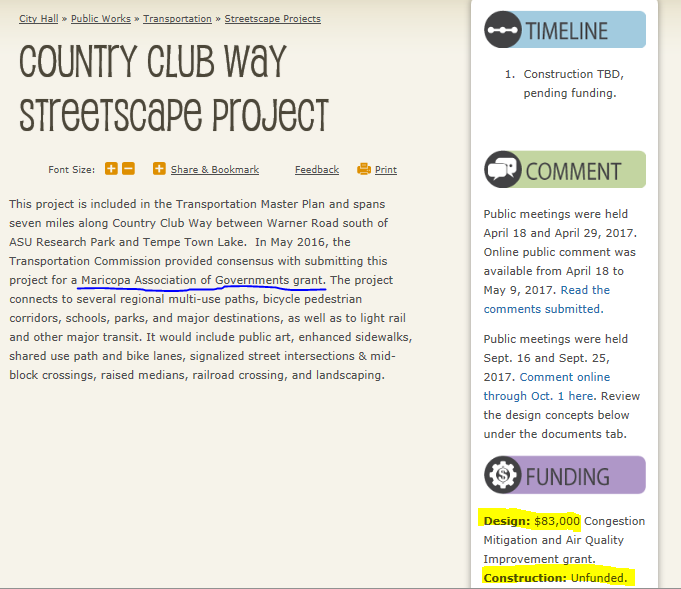 According to the City of Tempe’s website, construction remains unfunded at this point. So how does that parallel with Councilwoman Lauren Kuby’s statement on her Facebook reelection page? How does Ms. Kuby know what the final costs will be and how much federal government will actually pay for these bike lanes? There is a different administration in Washington than when this project was originally planned. If the new administration cuts government, especially the EPA, will the money for construction still exist? The answers won’t fit nicely on Ms. Kuby’s reelection propaganda, so it’s best for her to not explain too much to the voters. She may not want to share the results of the polling done on these bike lanes, either, which are posted on Tempe’s website. 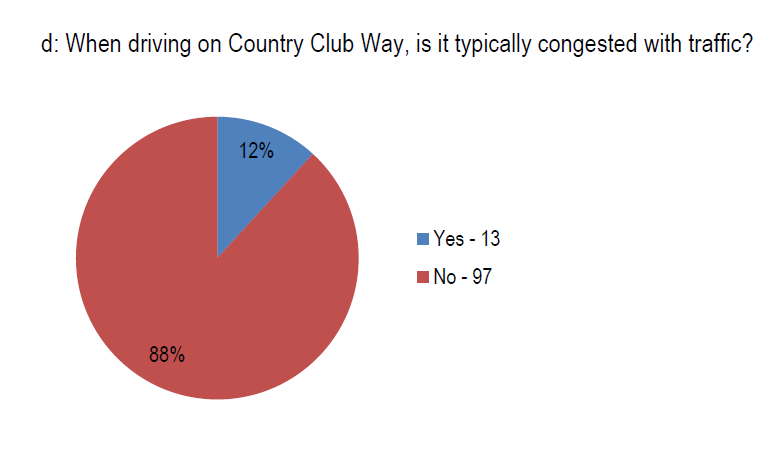 Overall, Tempe residents who live near Country Club Way are pretty satisfied. When reading the comments posted, it appears there is some need to improve some select areas of Country Club, but not all of it. And why is the following question important? There are several schools along Country Club Way. Construction, along with the boatload of cars transporting children to and from school will be a nightmare, both for the schools’ attendees and the local families trying to get to work on time. And the proposed horse trails combined with bike lanes in the South Tempe area are inexplicable. It doesn’t matter, though. The money grab from the federal government is more important. For some reason Tempe Council never tells its citizens that grants from the federal government aren’t free, the funds come out of each of our paychecks. 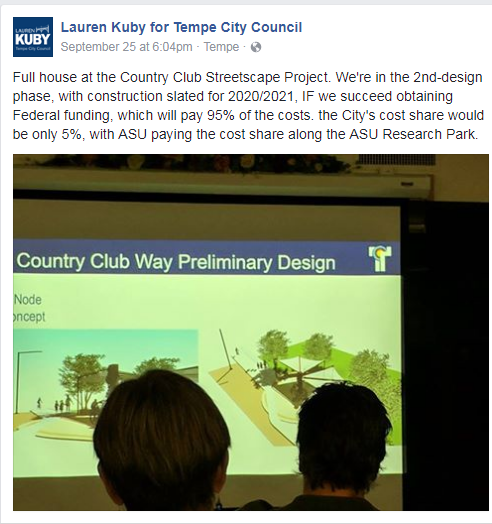 Three years ago, Candidate Kuby campaigned telling us she valued Tempe neighborhoods. We thought she meant she respected our individual communities and would let us enjoy them. Now we realize she sees each neighborhood as a personal and financial power grab.